But now we’ve gotten ourselves into a bit of a trap. We’re heading to Italy tomorrow where we will spend the next five weeks walking up and down hundreds of steps every day, and the last thing we want to do is to carry our heavy 3-year-old everywhere we go. So I need to have some tricks up my sleeve for encouraging her to walk. I know the promise of gelato will be good incentive for her to walk… but you can’t dangle that carrot all the time. 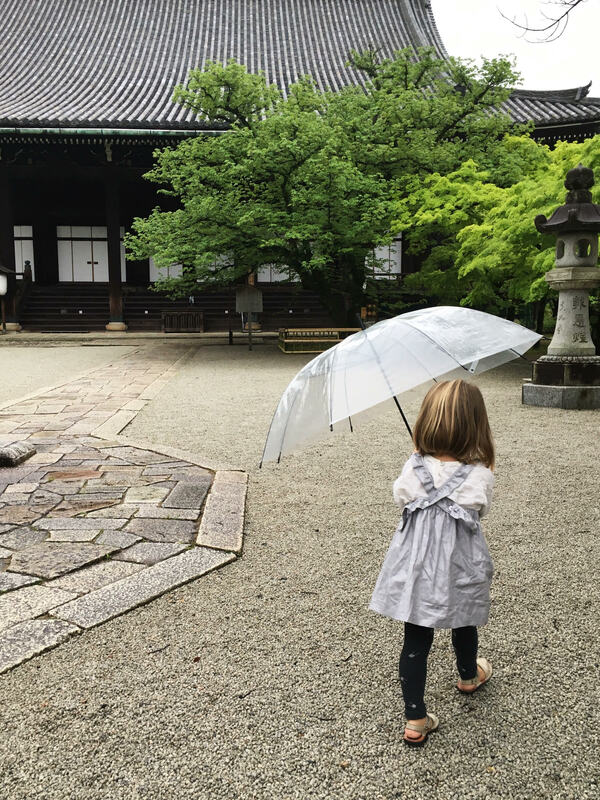 A couple months ago while we were in Japan I realised that if I gave Marlow her own umbrella to carry, she would walk happily without complaining, which proved that she will walk if distracted – it’s all about getting her to forget she’s walking. Please share if you have any other tips. I’d love to hear! Five weeks in Italy – how wonderful! Will you hook up with Lauren and her lovely family? Our four year young is a little like M – quite cunning in the way he avoids walking very far. We get him to count cracks in the pavement (even jumping on them! ), swing his yoyo (but he can get carried away with swinging it in all directions) and to pretend his hand has been superglued by magic to his seven year old sister’s. The things we do! Haha! I love all your tricks. My four year old has always wanted to be carried but she’s got to a weight where it’s difficult to carry her all day. It’s hard to enjoy the day when you are effectively doing a tough workout all day. 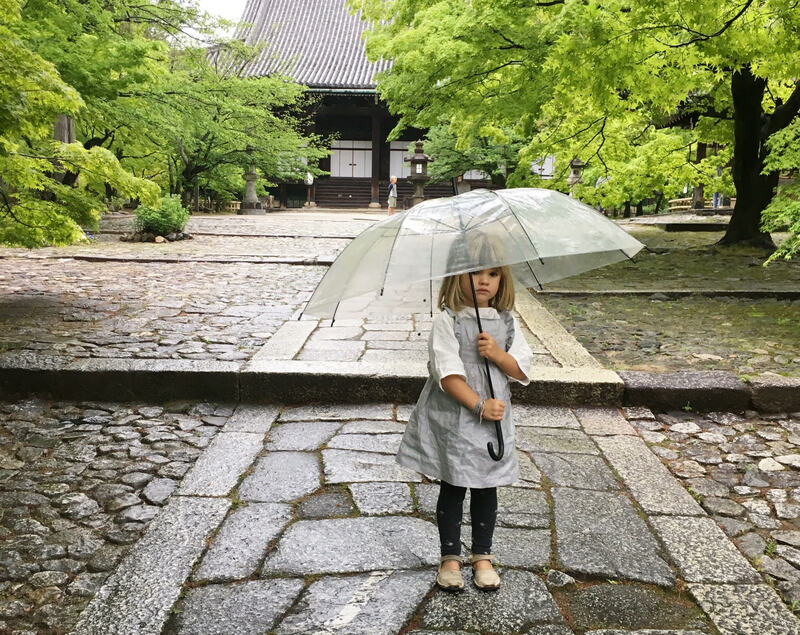 But coming from a gentle parenting child-led perspective my feeling is that it’s an inherent need which will suddenly disappear and they will never want to be carried again. Very attached children ultimately become very independent when it’s child-led. 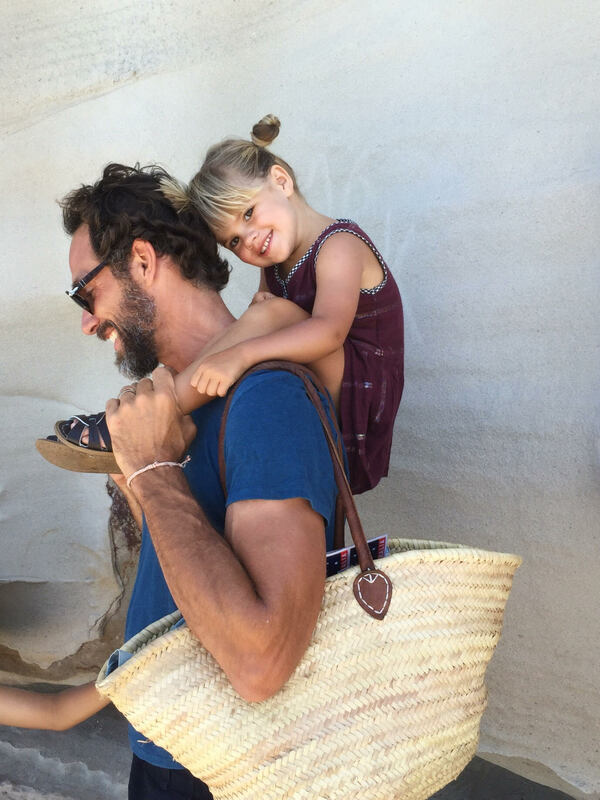 With my daughter I feel being carried is part of her love language in that it’s part of her way of feeling loved and protected when she is being carried. It could also be a proprioception issue in terms of the information the joints are receiving during walking. For example, if there is any hypermobility, there might be a subtle unconscious anxiety when walking. You’ll never see a pre-teen being carried so no doubt it’s something each child grows out of at some point. Although it’s tough to carry my daughter and at times I physically can’t because of carrying other things, I do feel it’s a need she still has. It offers her security and physical contact. For the times when I just can’t carry her we use the scooter (although this does backfire and I have to carry her and the scooter). I don’t have any solutions other than to realise that it’s about a child communicating a need and it’s a phase that will end. That’s what I tell myself when I feel like running a marathon would be easier! Thanks for taking the time to write this thoughtful comment. I agree with you that it’s just a phase and that all our children will eventually walk (and I’m sure we’ll miss these days of carrying children around everywhere). But… it’s also not great for our backs to carry her, especially for such long distances. This week we got a hand-me-down scooter from friends and it has really helped. She’s not asked to be carried once this week. My mum has a good trick though. She tells him he can run to the next or second etc. lamp post. Strangely, it works. Timing on a phone is an extra trick. “How quickly can you …. ?” Tapping into their competitive spirit! Or “Can you run to the next red car?” We also count door numbers; also great for learning 2 x table, odd/even numbers and big numbers. My now 5 year old would complain a lot at 3 and as I was pregnant I really had to phase the carrying out. I tried to replace it with cuddles at other times (and my husband still carried her for awhile) and by the time she was 4 it was a phase that had mostly passed. It also helped that we did lots of big “explore” outings in our neighbourhood where she could choose where to go and set the pace. If you are trying to get somewhere on an adult’s schedule, I think a scooter or loopfiets (balance bike) is easier for them to keep up with. I also feel that my 3 year old does not walk when he is bored or tired or having a bad moment/day. So I help out, or compromise (depending on what else I am carrying): i’ll carry you a bit, you walk a bit, i’ll carry you up to/after the red car. He is a lightweight (14K) so it’s not too difficult to still use the manduca – on the back though! And he likes his cuddles there too, resting his head etc. I also know having an older child that I will soon miss these moments and try to cherish his needs. But it’s fine balance between their needs and yours. I can second the camera trick! My recently turned 4 year old has inherited our old digital point and shoot, and she loves to walk around taking pictures. It’s also fun and interesting to see the world through her eyes. I’m planning on buying a scrapbook and some supplies for her soon so we can print out some of her pictures and she can start a scrapbook of her memories. Often on holiday you can buy push along stick toys with jingle-balls in them. They are so good at making kids walk because they love the (annoying!!) sound which is made when it is pushed! arghhhhhhh she is the most beautiful child!!!!!!!! it’s already on your list but we used a scooter alot when she was inbetween needing her stroller and being able to walk a long ways. But really it’s about practice because now she can walk and walk and walk and she’s not even four yet. Like Jess, I also think some children have the need to be carried because they want to be close – same as coming into the parent’s bed during the night. We did a hiking tour in Switzerland a two years ago, where we had to walk a lot everyday and also uphill for hours. 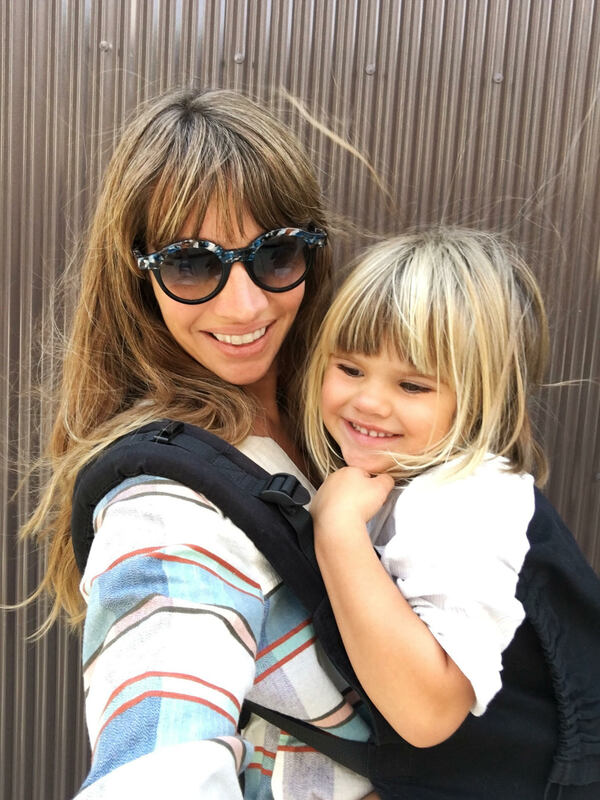 So I ordered a Tula Toddler Carrier – a special toddler carrier, which is the same system as a Manduca / Ergobaby, but bigger and much more comfortable for both the toddler and the one who carries. My husband had to carry our four year old son for three hours straight (because he fell asleep!). The trip wouldn’t have been possible without this carrier. I love children’s crearivity, for this reason I came up with a game: Imagine who lives behind the door we are passing by. Children have lot of stories to tell. For example if they found a big door they imagine that there is a giant inside the house, or when they found smaller doors they tell stories about small grannies who cook the best cakes of the world. It is so funny to listen to their stories and it is think that a telling them a famous story or reading them a book is more important than letting them create new ones. We have always been a carrying family, we used slings a lot but our pram/pushchair has not had a lot of use, I like to keep them close, I feel secure that they are safe and happy and I hope they feel the same. A word of warning though my third daughter did constantly say her legs hurt/were tired etc so we would pick her up, it turned out she was rolling her feet and causing actual leg pain, an insole (specific to her need) has corrected the problem, from the first day of having them we noticed she would walk without a single complaint. See what happens with our fourth baby, he already loves his baby sling…! My kids play the 100 game with car plates (who can find one that sums up 100!) They also play this invented “video game” with points and traps with all sorts of lids on the pavement: they have to step/prevent form stepping on it. This, of course, has all kinds of sounds attached. Singing also helps, we sing all the time. Beattles to Father John Misty fans. There’s also the collecting textures activity (with a piece of paper and a pencil all over those pavement lids) but that will take a while! Here in Portugal we have black&white pavements so we also play the “only in the black” game. We also have a lot of steps here so we just count them and feel like heros at the end. Maybe it would be fun to get a pedometer. When we travel we try to point out all the different things to se but sometimes, of course, we have just have to get them to walk beacuse we say so! Sorry that should say the middle has turned four! In Italy street vendors sell sun umbrellas – they’re a good idea on a hot day. Jump rope! My family recently traveled to France for a week and I was very concerned about this exact issue with my tiny 6 year old who is used to hitching rides. BUT! She packed her jump rope in her little back pack. She was not an experienced jump roper but really wanted to practice. She ended up jumping rope for miles around Paris. It was a great thing to whip out while waiting for the train, while “resting” in a park, while her parents were consulting the map or taking photos or trying to have a conversation! We ended up searching for a jump rope for my older son for the sake of family peace. I love that we have a whole series of photos with my kids jumping rope around Paris. I know that won’t happen on every family trip of ours, so it was sweet to enjoy it while it lasted. Side note: the jump rope got flagged by TSA on one of our domestic flights in the US. They took her backpack and dismantled the whole thing and had a good laugh that it was “just a jump rope”! PS my kids and I LOVE watching that Marlow surfing video that you posted on Instagram so much. It brings such a smile to our faces! I wander if being carried is Marlows way of “keeping close” to her family while in unfamiliar territory?! It might just be her thing while you are all on the road, & something that quickly disappears. It must be so hard to resist that face!! I don’t want your adventures to stop! It’s been fantastic travelling along with you!